It appears that Maajid Nawaz has just heard Sam Harris admit that he has carelessly fanned the popular myth of the “clash of civilizations” scenario, the popular view that Islam and the West are incompatible and conflict is inevitable when they meet. Unfortunately it seems to me on reading this dialogue that Nawaz himself has at times tended to hear “only what he expected to hear” from Harris in his sincere efforts to establish a constructive dialogue. We are at war with Islam. It may not serve our immediate foreign policy objectives for our political leaders to openly acknowledge this fact, but it is unambiguously so. It is not merely that we are at war with an otherwise peaceful religion that has been “hijacked” by extremists. We are at war with precisely the vision of life that is prescribed to all Muslims in the Koran. . .
Samuel Huntington has famously described the conflict between Islam and the West as a “clash of civilizations.” Huntington observed that wherever Muslims and non-Muslims share a border, armed conflict tends to arise. Finding a felicitous phrase for an infelicitous fact, he declared that “Islam has bloody borders.” . . . .
One need only read the Koran to know, with something approaching mathematical certainty, that all truly devout Muslims will be “convinced of the superiority of their culture, and obsessed with the inferiority of their power,” just as Huntington alleges. And this is all that his thesis requires. That is an unambiguous assertion that (1) we are at war with effectively the entire Muslim world and (2) bloodshed is (with near mathematical certainty) the inevitable consequence when our Western culture meets a Muslim culture. While there are undoubtedly some “moderate” Muslims who have decided to overlook the irrescindable militancy of their religion, Islam is undeniably a religion of conquest. The only future devout Muslims can envisage—as Muslims—is one in which all infidels have been converted to Islam, subjugated, or killed. The tenets of Islam simply do not admit of anything but a temporary sharing of power with the “enemies of God.” . . . So even those tiny few moderate Muslims hidden away like a tiny needle somewhere in that big haystack are only moderate for the time being — they differ from the majority only in the time schedule they have for when they kill all unbelievers. Is it fair to bring up these unambiguous “clash of civilizations” statements by Sam Harris when reading his dialogue with Maajid Nawaz? Shouldn’t we be looking for the best and a change of heart so that the ex-radical, the one with the experience of being a leader of an extreme Islamist movement, might positively enlighten Harris to some extent? Would not such a shift be a positive step forward for a more informed way of publicly discussing today’s problems with Islamist extremism and jihadism? That was what I really was hoping and even to some extent expecting to see. The sad fact is that since this book has appeared we have seen Harris repeat some of his worst “incomplete” information, his denial that he has ever said anything controversial — those who attack him have misrepresented him, he says, because, he says, he was really meaning only the most banal of truisms that everyone takes for granted anyway! — and that he does not resile from anything he has said in the past. And after reading the new book I’m not surprised. Despite the high hopes expressed by Maajid Nawaz . . . . or rather, there is something amiss, something ajar, when those hopes are expressed in the same book that continues to advertise The End of Faith on the front cover (okay, that may have been a publisher’s decision over which neither author had any say) but then again we read a recommendation for the same work (as “suggested reading”) at the end of the book along with the approving signatures of both SH and MN. Did MN really commend that book as “suggested reading”? Posted on 2015-10-21 11:12:42 GMT+0000 by Neil Godfrey. 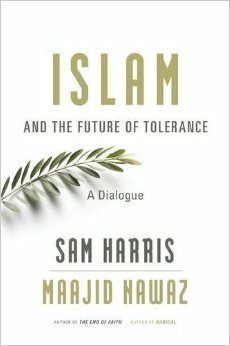 This entry was posted in Book Reviews & Notes, Religion and tagged Harris-Nawaz: Islam and Future of Tolerance, Harris: End of Faith, Islam. Bookmark the permalink. End of Faith was, in a sense, deeply reactionary, as was almost all American culture in the five years or so after 9/11. This mania is what lead the otherwise not-to-be-fooled Chris Hitchens to wholeheartedly embrace the Bush foreign policy. This is not an excuse, but mere contextualization. Actually, American culture in general was not reactionary at all towards Islam in the early years after 9/11. I think Bush 43 does deserve some credit for this. Recall the Iraq War had nothing to do with Islam at all. Even the New Atheists took several years to gather steam in demonizing Muslims. The End of Faith was published in late 2004 and didn’t hit the best seller list until mid 2005. Islamophobia didn’t pick up a full head of steam until Obama was elected. One of the reasons the invasion of Iraq enjoyed strong support among working class conservatives is the underlying hatred of Muslims and the belief that one nation of “sandni—-rs” is the same as any other. No I don’t, honestly, thank you. But the claim was “all of American culture”. Of course there were many instances of individual reactionary and violent behavior. There was general xenophobia and racism involved in support for the Iraq War. But it was marginal in actually causing the US to invade Iraq. …and Islam itself was not an issue at all. Recall that the main reason for the yellow cake lie and the mobile bio-weapons lab lie. The Bush/Cheney administration wanted the American public (and the world) to believe that Iraq would develop these weapons and share them with Islamic extremists who would deliver them to targets in North America and Western Europe. For those lies to achieve their full effect they needed to make us afraid that these weapons would fall into the hands of Al Qaeda. And for that to make any sense they had to push the lie that there were operational ties between the Iraqi government and Al Qaeda. So the ultimate threat that they were pushing (i.e., what they were trying make us terrified of) was WMD used by Islamic terrorists. Whether the power elites in the U.S. and U.K. who pushed for the war really believed any of their own lies is unclear. I remember one administration official at the time being quoted as saying that they were “creating reality.” They thought they were going to remake the world in their image. What a mess they made. I was referencing HoosierPoli’s comment. As for mine, “in general” is a qualifier. But I’ll take back “at all” to be more circumspect, if that works better for you. My claim is America got more Islamophobic especially, but also more anti-Arab, the farther we got from 9/11. Where the starting point was is debatable. And I was referring to the culture expressed in public, not inherent racism under the surface. Your “large parts of American culture” is just as nebulous a meaning and as hard to prove as my comments have been. I’d leave anti-Iranian off the discussion entirely. I think it would be hard to find even much anecdotal evidence for that in the early 2000’s. The main reason for the lies were to invade Iraq, a goal of neo-cons since the late 1990’s and a decision made well before any public attempts at linking Saddam to al-Qaeda. After the fact PR is not relevant to just how racist and Islamophobic America was in 2003. And recall there were half a million people marching in the streets opposed to the war and not scared from government propaganda. Listen to the followup interview on Secular Talk for a 2 hour interview between Kyle and Sam Harris. Finally a discussion about what Sam said and did not say. Thank you for leaving out the Greenwald-like personal attacks. We need more discussion like this. By the way, in principle one could posit a Clash of Civilisations between the Western world and the Arabs (or “and the Arabs and Turks” or “and the Arabs and Turks and Persians”). “Islam” then would simply be a very imprecise shorthand for groups of people that the West would find equally clashy even if they converted to Christianity or Zoroastrianism or Juche. Not sure if Huntington addressed whether or not Muslim religion is necessary for The Clash in his view. Harris doesn’t seem to have a lot of interest in secular group conflicts. Can one say that demonizing Muslims/Islam is the only recourse if one is endorsing war?…after all, how is one supposed to sleep at night if one’s nation is killing off good, noble, civilized, people?…it just makes you the bad guy!…..